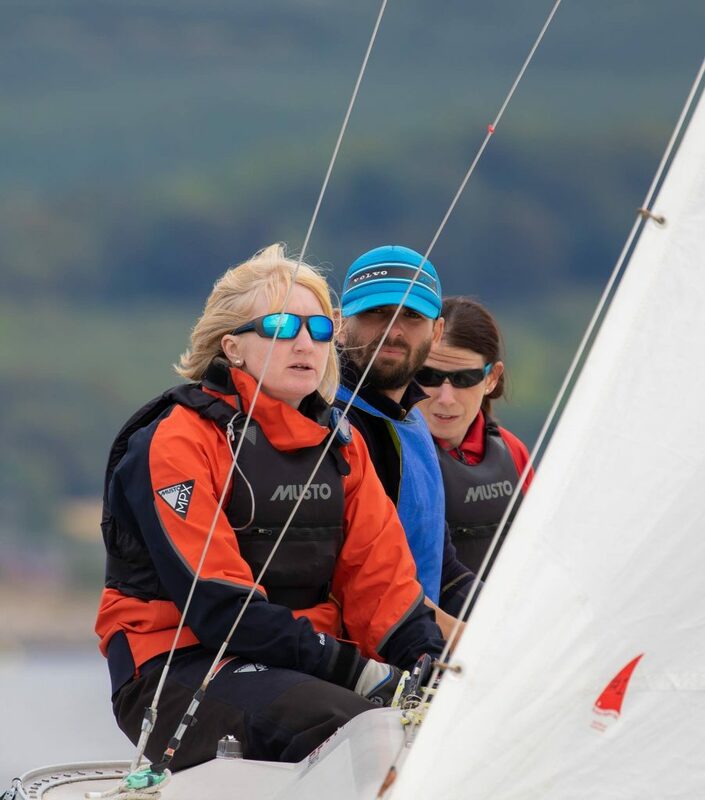 The GBR sailing teams have just returned from a world championship sailing regatta in Scotland. It was the world blind sailing match racing championships. 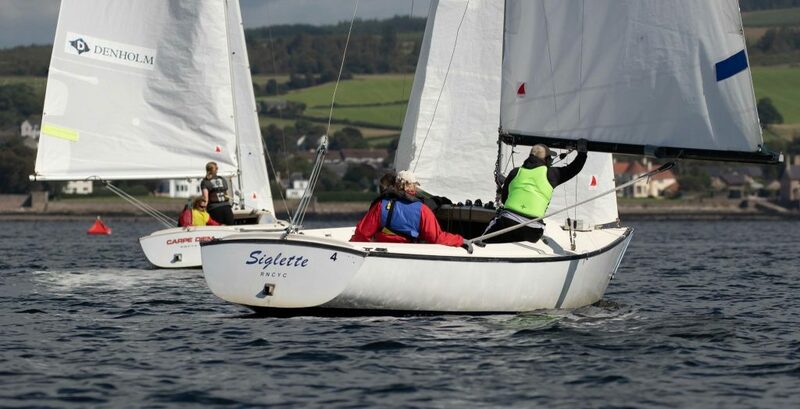 We sailed from the Royal Northern & Clyde Yacht Club, who were exceptionally hospitable. They say that you can get four seasons in a day in Scotland, and we did every day. I’ve never had so many kit changes, and learned to put sun block on even if it was raining. We had some great sailing and very close quarters racing in a variety of wind conditions. We entered two GBR teams, and I helmed the boat for the GBR1 team. Both teams did very well – GBR1 won gold medals (me, Liam and Lucy Hodges) and GBR2 (Sally Rodrigues, Laura Cammige and Eddie Kitchen) won silver. Summaries of the GBR races are below. 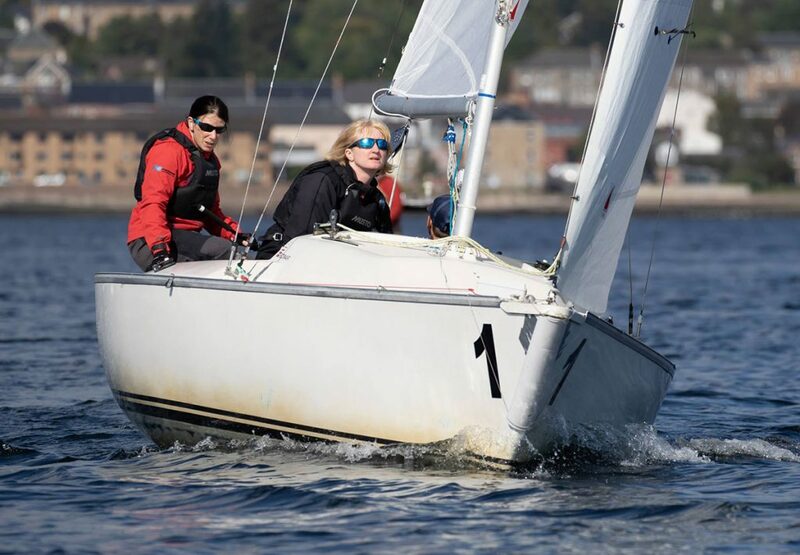 GBR blind sailing can coach visually impaired people from beginner to racing competitively. 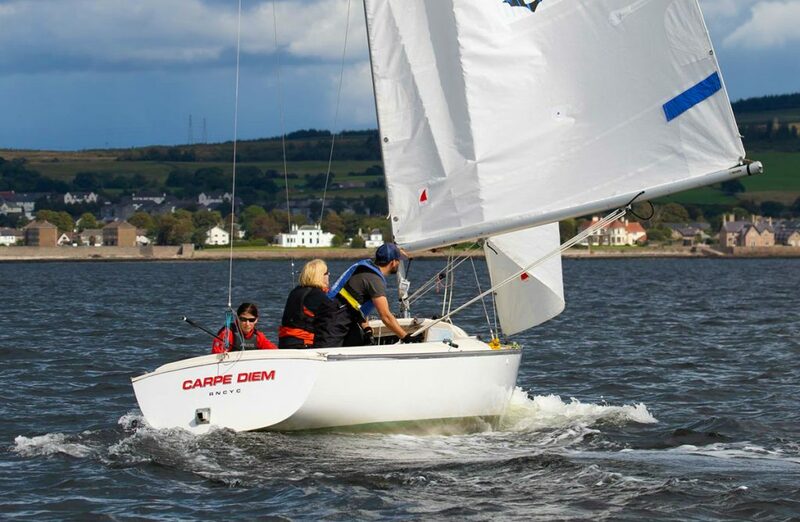 Please contact blind sailing through their website if you are interested in coming along to a training weekend. All teams woke to strong breeze but the weather forecasts were saying the wind would drop to 1-2 knots around 13.00. The teams arrived early at Rhu Marina. All boats headed out to the East race course which is positioned just in front of Helensborough Town. The wind had started to drop but racing was started promptly at 10.00. The first race was quickly abandoned after a 90 degree wind shift and racing postponed for the wind to settle. The race officer gradually moved the racing course further to the South, so racing could get underway. The breeze remained light throughout the day, reaching a maximum of 9 knots. Due to the conditions, only 7 races were completed out of the first round Robin. GBR 1 met Canada in match 3 – GBR battled with Canada throughout the start but with 1 minute to go went back to ensure they made a good start. they hit the line dead on the gun with good pace, continuing to maintain boat speed in the tricky conditions held their lead to gain a win. GBR 1 then met GBR 2 in match 4 – the wind was steady with breeze filling in from the left-hand side of the course. Both teams made a good entry seeing GBR 1 Sharon Grennan looking for a penalty just after entry, but GBR 2 tactician Laura Cammidge kept boat speed up and manoeuvred away. Both boats made a good start at opposite ends of the line with GBR 2 starting on the port end and GBR 1 at the starboard end. Both boats had good speed, but with a few good tacks from GBR 1, they pulled away and maintained their lead for the rest of the match. Match 5 was GBR 2 against Australia – GBR 2 made a good entry attacking Australia early, but Australia moved into a good position and had a clean entry. Both boats headed to different areas of the starting box, with Australia heading downwind and GBR 2 heading across to the starboard side. GBR 2 made a good start and held a good lead to the top mark. But with a slight bit of tide catching them out at the windward mark, they received a penalty for hitting the mark. This was cleared quickly and a strong win was taken. GBR 1 was back on the water for Flights 6 and 7. A short wait for the breeze to settle and flight 6 was underway, GBR1 against Australia – a good entry by GBR saw them sail across to meet Australia, with a tight battle a penalty was awarded to Australia. GBR sailed across to the starboard side and made good progress around the race course to take there third win. With the wind still light at 5 knots, GBR 1 met USA in Flight 7 – this again saw both teams try to gain a penalty, but the boats split and GBR 1 made a good start and held the lead to win all four flights in their first round robin. All teams arrived at Rhu Marina, hoping for a start time of 10.00, but the sun was shining and the water was a perfect mirror. So the racing was postponed whilst we waited for wind. It wasn’t a long wait, by 11.00 the teams were called to the East Race Area, where the breeze was due to build and by 11.30 the final races of the first Round Robin started to take place. A good battle at the start saw both boats spinning and trying to gain position, but GBR 1 kept an eye on the start line and lead back first. Keeping good boat speed around the course help them to take their first win of the day. 1 had a good strong start working the tide to the top mark. It was great to see the teamwork across both GBR boats, constant communication and keeping the boats moving in the light wind conditions. GBR 1 won, keeping their 100% winning score. Day 3 started the same way as day 2 with all sailors held ashore waiting for the breeze. This time gave all teams a chance to meet the sailors from France, who had brought there new app for Vi and sighted sailors, SARA, to test. By 11.30 the wind started to fill, so all teams headed out. The breeze had built up to a good 8 knots with tide across the course from the West. Race 1 of the day saw GBR 2 meet the USA – After a small battle at the start and an early entry by GBR 2, they lead the USA back to the line and took the lead at the start. The USA were not far behind with some good covering on the first leg, GBR 2 arrived at the top mark first. A poor mark rounding from GBR 2 helped the USA to recover the ground that they had lost. With an effective downwind leg goose-winging the jib GBR 2 managed to extend the lead again. Despite needing to take a penalty on the second downwind leg they retained the lead. The race closed with a nail biting finish as GBR 2 only heard the finish line marks late on in the downwind leg and nearly missed the finish line. Realising their mistake they recovered and crossed the line to take a win. When GBR 1 raced against Australia the wind had dropped slightly and the tide was stronger. GBR 1 was slow to enter but crossed the line in time before the two-minute gun, GBR 1 had a great start and took the lead, which they extended to a leg by the second beat and won the race comfortably. The race committee kept the racing going in the changing conditions with a course change. As the wind speed increased the course was extended. Next, GBR 1 met the USA – At 4 minutes till the start GBR 1 and USA were jostling for position on the start line. GBR 1 started at the port end, then tacking onto port tack and crossing comfortably ahead of USA. USA worked the starboard side of the course while GBR 1 worked the port, gaining a one leg lead after the first lap. This was a clear win for GBR 1 with a leg to spare. GBR 2 won the next race against the USA. GBR 2 gained half a leg lead at the first mark. The USA became a little disoriented, whilst GBR 2 effectively navigated to another win with one leg to spare. Race 5 sore GBR 2 meet Canada, it had been a tussle the day before and the first beat of this race started just the same. Both GBR 2 and Canada approached the start on starboard tack. Canada were the leeward boat, then they tacked onto port forcing GBR2 to change course. Despite the unsettling start GBR 2 sailed effectively but due to the tide, Canada tacked back on to port ahead of GBR 2. But with Canada sailing slightly off the breeze, it saw GBR 2 gain a half leg lead by the second beat which they extended to almost one leg by the finish. At the end of Day 3, GBR 1 finished on a 100% and GBR 2 only losing two races to GBR 1. Both teams got through to the semi-finals. Day 4 was Semi Final Day At The Blind Match Racing World Championships. At the start of the day, all teams waited ashore for the breeze to build. 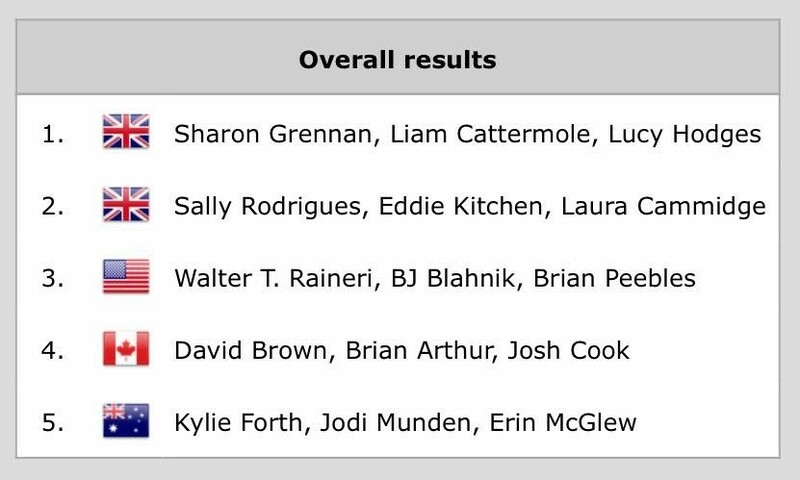 With GBR1 finishing the qualifying series in the lead, they got to pick their opponents for the semi-finals; GBR1 Sharon Grennan picked USA, which meant that the second semi-final was GBR2 against Canada. By 11.00 the breeze was an average of 8 knots. Race 1 was GBR1 on starboard entry against USA on port. Both boats entered well but a pre-start port starboard incident meant that USA gained one penalty. GBR1 tacked for the line in front of USA, but USA had a bit more speed, forcing GBR1 to tack on to port. USA followed GBR1 on to port and quickly dropped into their dirty air, GBR1 pulled out a lead which they maintained to the end of the race. GBR2 then met Canada for their first race of the semi-finals, GBR2 on starboard and Canada on port. GBR2 entered early along with Canada both boats seemed to have started their watches early and missed the calls over the radio to correct the time. Both countries started and continued upwind with a minute till start time. The race committee announced that both boats were on the course side of the start line at the start, they returned to restart and GBR2 sail back across the line first but met Canada on starboard and had to tack, this gave Canada a clear run up on Starboard. Both boats sailed upwind well but a slight wind shift in the second third of the beat saw GBR2 round first. Sailing Day 3 Blind Sailing ChampionshipsBoth boats came downwind together but with a better rounding at the bottom mark by Canada, they got back into the lead. GBR2 pulled back on the run but good positioning by Canada gave them the right of way and crossed the finish line just ahead of GBR2. A very close and exciting race from start to finish. Then, GBR1 was back on the race course with USA. USA were on starboard entry with an increasing breeze. USA entered early and hit the mark so gained two penalties pre-start. GBR1 unsuccessfully battled with USA to try to gain a third penalty against USA, which would have disqualified them from the race. GBR1 got a clear start ahead of USA and with the wind building, they managed to extend their lead throughout the race, putting them in the finals the following day. 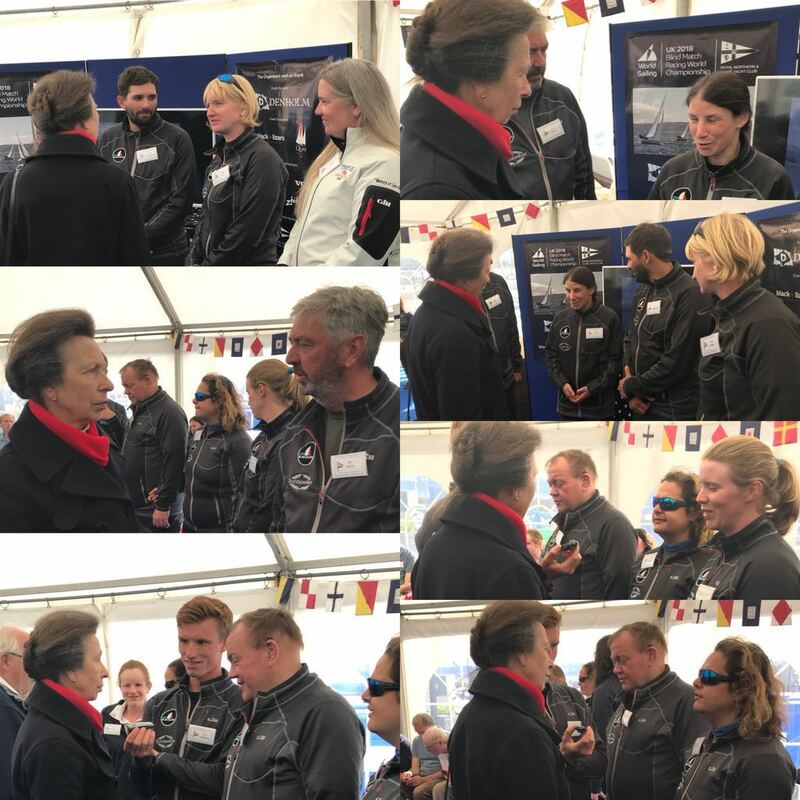 HRH Princess Anne watched this race and then spent time meeting all of the competitors and officials. Then, back on the race course, GBR2 and Canada battled it out for a place in the finals. It was again a battle at the start and around both laps of the race course for each race. GBR2 managed to just stay ahead of Canada after losing the top mark and sailing a slightly longer course. But it was back to 1 all. After a few alterations of the course, GBR2 and Canada started their third semi-final race. Canada had a good start, heading upwind with GBR slightly behind. After a small tacking battle, seeing Canada pick up a penalty, Canada rounded the top mark first. They managed to maintain their lead to the final leg, but halfway down the course started to goose wing and head dead downwind, there had been a slight wind change, GBR2 gybed just over half way down and headed for the line, Canada took their penalty allowing GBR2 to overtake and reach the finish line first. As both GBR teams won their semi-finals, they will face each other in the finals. GBR1 team remained undefeated in all of their 13 races over five days to become World Champions, also seeing Lucy and Liam take their third World title in Blind Match Racing. The final day, first saw the petite finals between Canada and the USA, both teams had a good chance of taking bronze. Canada had given GBR 2 a hard time in the semi-final, just seeing them miss out narrowly for a place in the final. The breeze was steady with a lovely 8-10 knots. Both boats had a little tussle at the start but it was to be the USA that took two start wins and held Canada off to take the Bronze medal. It was then the final – GBR 1 against GBR 2. The final is best of 5 races. The first race saw GBR 1 holding out GBR 2 before the start. GBR 2 just got away and with two minutes to go got clear over the line without a penalty. But a good strong start by GBR 1 saw them clear ahead at the start, making sure GBR 2 didn’t have a look in for the whole race. The second race saw both boats enter clean. GBR 1 controlled GBR 2 at the start, forcing them high of the line. Again, a good clean start by GBR 1 but GBR 2 close behind. With GBR 2 starting slightly to the right-hand side of the course they headed out on Port. GBR 1 kept to the centre of the course, but a slight wind shift saw GBR 2 gain hight into the mark. That wasn’t enough to get in front of GBR 1, who got a good clear cross. Then sailed a solid Downwind leg to take the win. The third race again saw both boats enter on time and GBR 1 headed across on Starboard looking for a penalty against GBR2, GBR 2 managed to avoid. Again, a tussle out at the starboard end all the way to the 1-minute gun. GBR 2 lead back to the line with GBR 1 following. GBR 1 saw an opportunity to hook GBR 2, GBR 1 went for the hook but the umpires awarded penalties against GBR1 for failing to give the other team sufficient time and opportunity to keep clear. GBR1 was given two penalties for the pre-start incident by the umpires. They quickly took their first one after crossing the line. But with good fast sailing by GBR 1 they rounded the top mark with GBR 2 five boat lengths behind, the race was still on. GBR 1 was first to round the bottom mark and head up the beat but a large tangle with the main and traveller meant they had to sail on the Jib alone. GBR 2 tacked over onto port into clean air and force GBR 1 to follow. Halfway up the final beat GBR 2’s mainsheet block broke. GBR1 had sailed straight to lay-line and headed downwind, completing their turn and crossed the line to take the win and become World Champions. GBR 2 limp to the finish after putting up an amazing fight to take silver. GBR 2 only lost to GBR 1 and once to Canada, which in its self-says something for all the hard work GBR is putting in on and off the water.